TEMPE, Ariz. — Slim Shots appetite controller has recently been made available in convenience stores nationwide. Slim Shot consumers will now be able to conveniently enjoy their favorite weight-loss product in a cup of coffee on the way to work, or simply like a “shot” of liquor. STG Media Corp. will kick off the convenience store rollout by placing Slim Shots into 30,000 convenient stores within 90 days of the launch. The blitz program will continue until the product is placed into 140,000 national convenience store locations. STG Media Corp. concentrates on placing products on the shelves of convenience stores with the proper media support and proven track record behind them. Finding an innovative weight-loss product in a $30 billion dollar market has been an obstacle that many manufacturers have not been able to overcome. However, Slim Shots has found their niche in this saturated market. Slim Shots is an all-natural vanilla flavored shot, found in a coffee creamer type packaging. The shot can be consumed in various methods including in cereal, yogurt, coffee or on its own. Also, unlike other weight loss products, Slim Shots does not contain sugar, caffeine or stimulants and does not cause nervousness or jitters. Slim Shots works by triggering the body’s natural appetite control mechanism, satisfying users for long periods of time and in turn, allowing them to eat less, without sacrifice and without depriving them of their favorite foods. 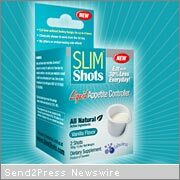 Slim Shots launched in C-stores in November 2008. STG Media Corp., STG Global Distribution and STG Interactive, LLC, work together to develop and execute strategic, national marketing campaigns. Based in Tempe, AZ, STG Media is a full-service advertising agency specializing in creative and media buying for print, television and radio. Helping clients to maximize their ad dollars, STG works hand in hand with STG Global Distribution, a master distributor and brand management company with capabilities to place products on the check-out counters in over 100,000 C-Stores in the USA with a proven market blitz program. STG Interactive develops cutting-edge E-commerce solutions in addition to search engine optimization and search engine marketing. STG helps clients navigate through the complex landscape of opportunities that exist within the context of modern, cross-media campaigns. For more information about the STG family of companies, call toll-free: 866-834-4370 or visit: www.stgmediacorp.com.